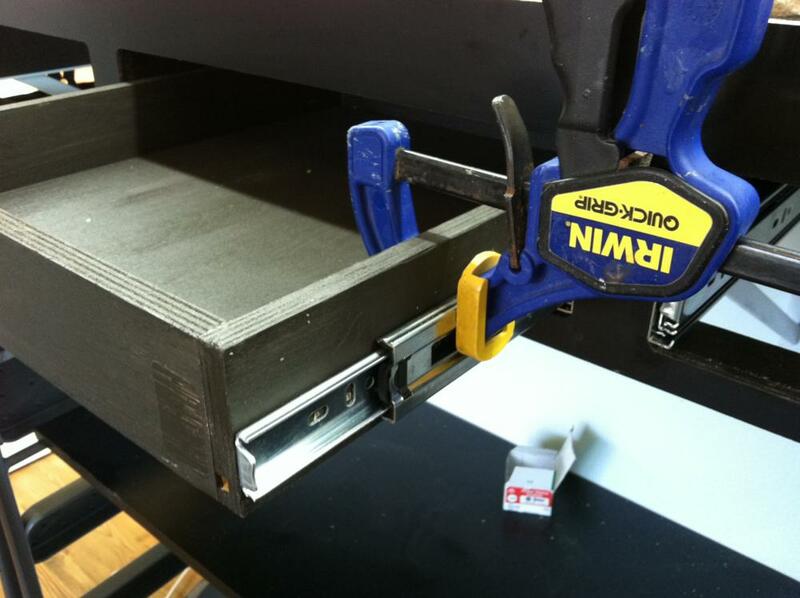 I cut the remaining drawer openings into the bench work. I’ll now have three drawers on the east side and one on the south. 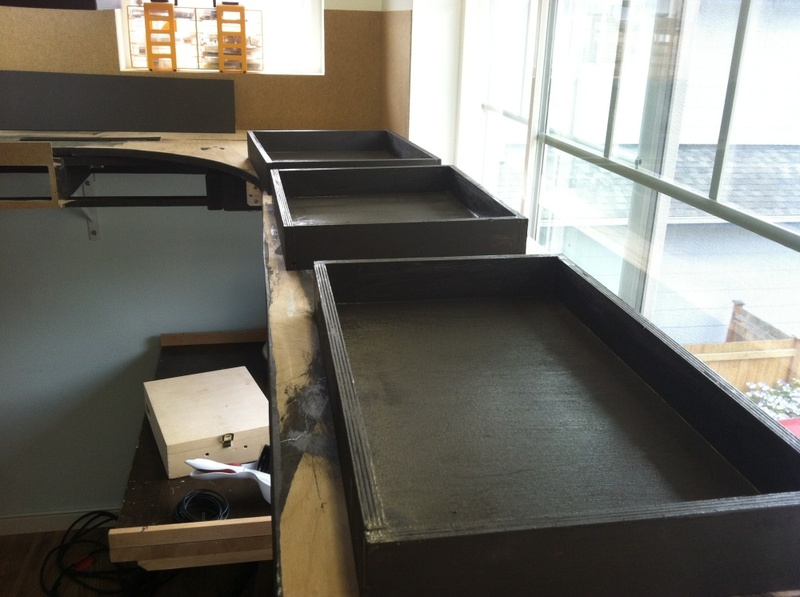 I still need to make the fourth drawer, but I got busy painting the three that have already been built. I started into some layout electrical. 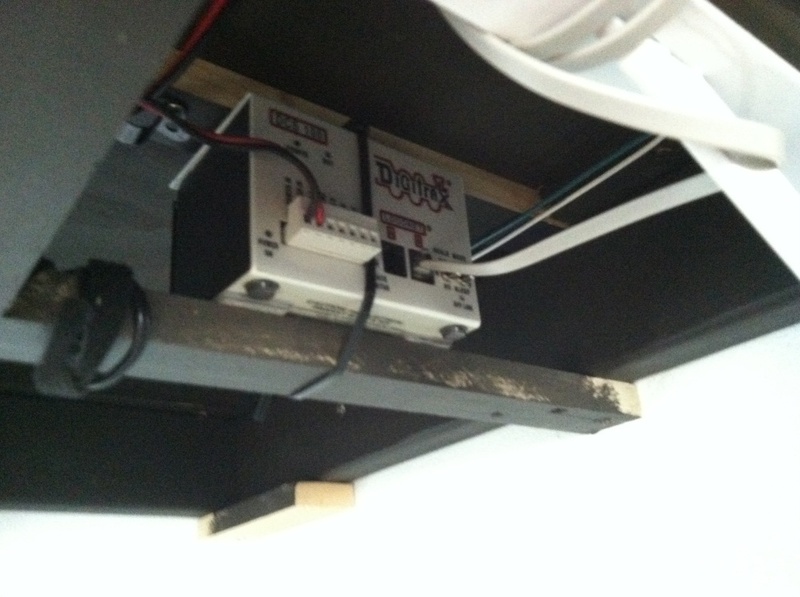 I sited my Digitrax DCS100 command station beneath the layout. 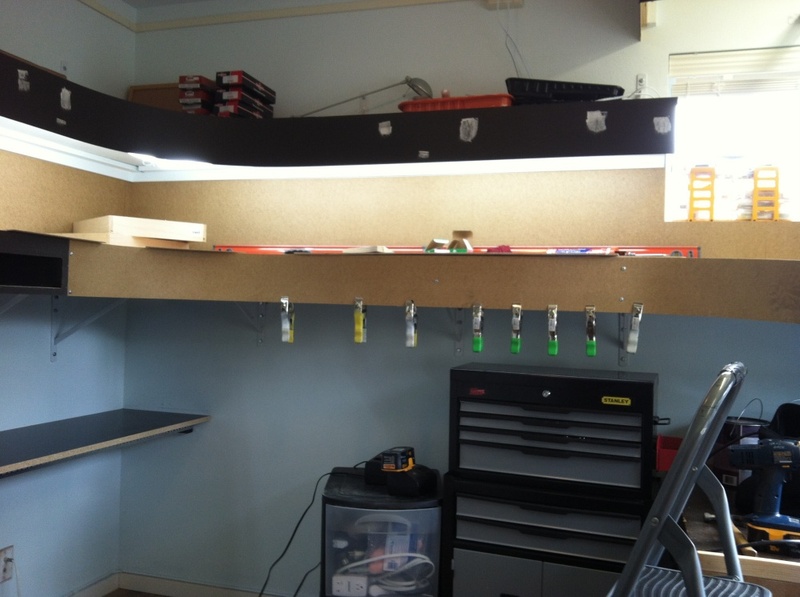 I ran two buses: red/black for DCC & white/green for layout lighting. I also sited the Digitrax UR92 radio receiver. 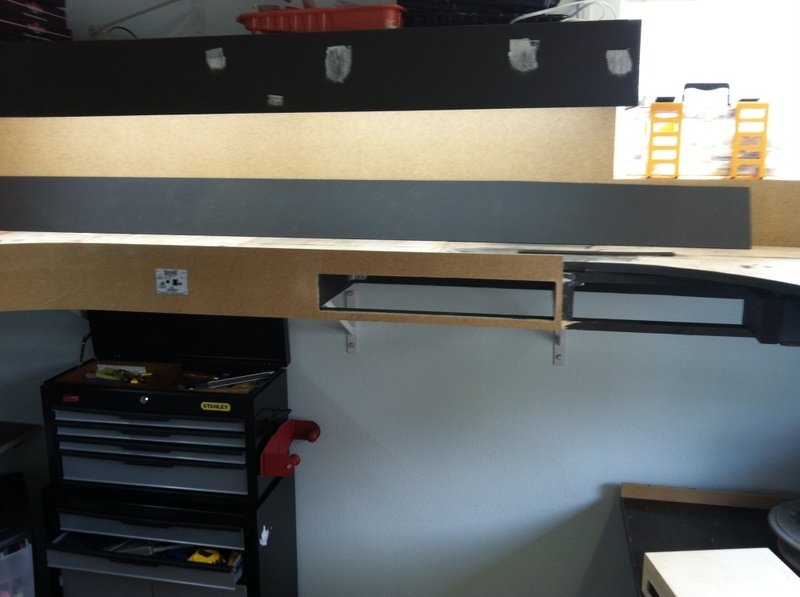 I think I need to completely finish the fascia before I install the drawers and start laying track. I plan to be doing some more fascia work as time permits. 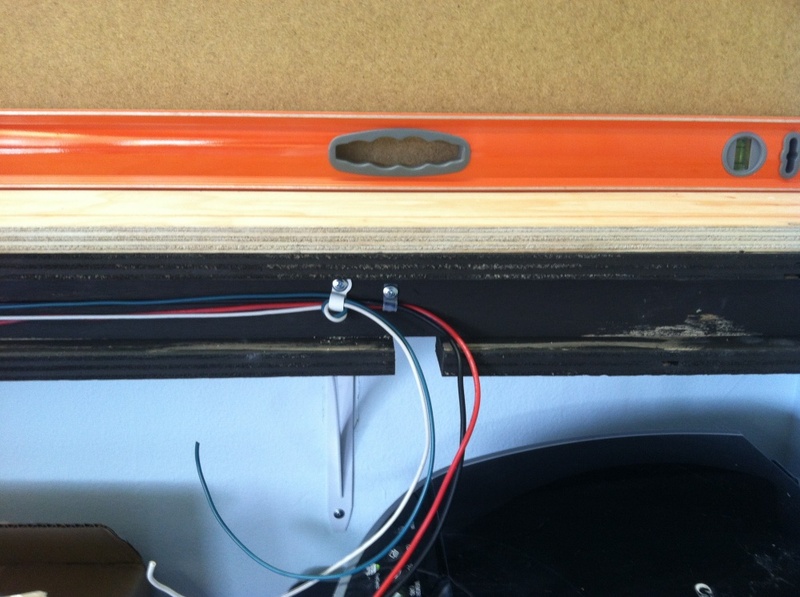 I’ll also be installing the Formica fascia on top of the hardboard. I didn’t want to bother myself with installing a sound decoder into my BNSF Kato SD40-2, so I bought a BN Kato SD40-2 with ESU Loksound installed from Model Train Stuff. It looks awesome. I haven’t tested it yet (no track wired up) but it comes with sound decoder and ditch lights. I wanted to have a locomotive on hand to start testing as soon as I could and this was my top choice. 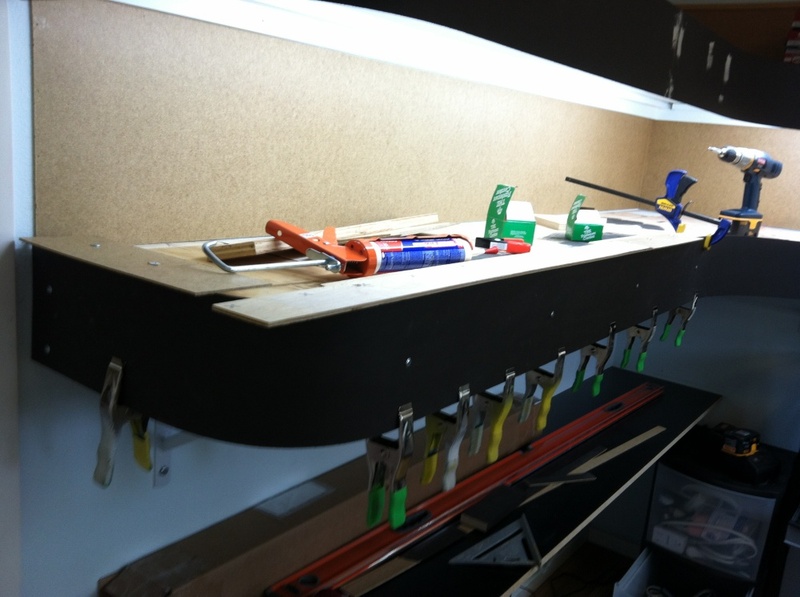 I started installing the lower 1/8″ hardboard fascia. I had it cut into 6 1/2″ strips at Home Depot, but I wish I had just taken it home and cut it myself because most of the strips are not straight. The fascia is glued with PowerGrab adhesive and tacked with brads. 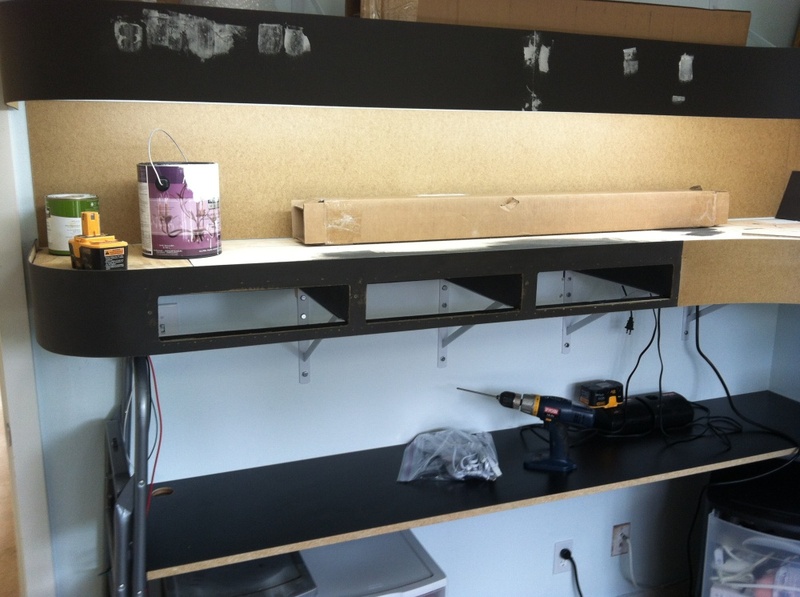 I used a screws and clamps to help hold it into place while installing. 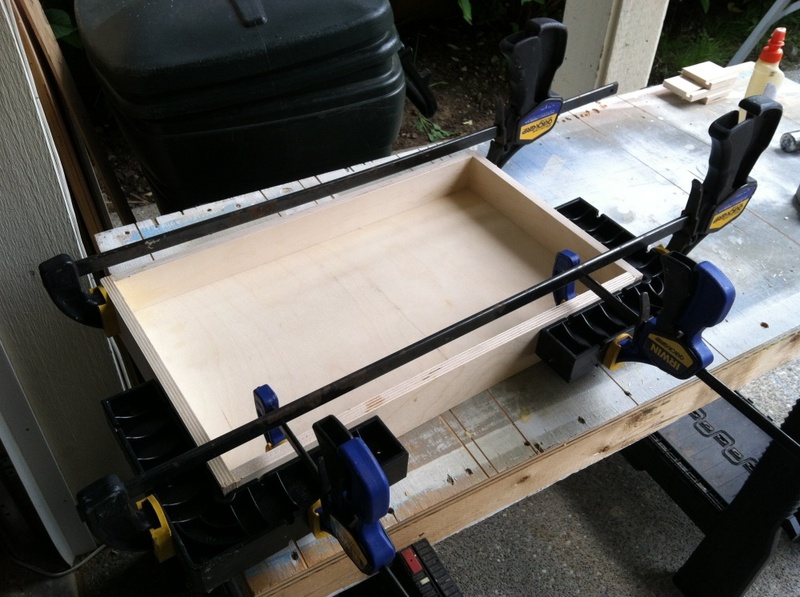 I routed out openings for drawers (which causes a terrrible dusty mess). 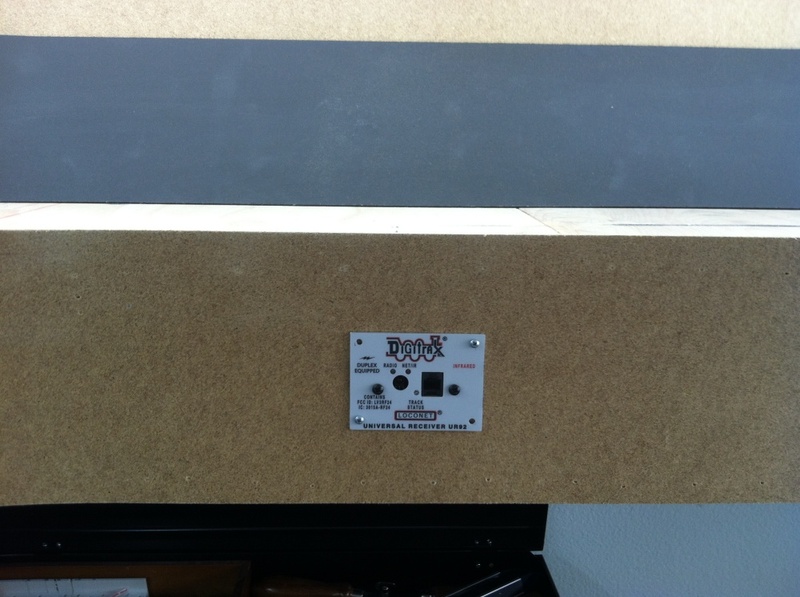 I’m still considering a laminate countertop fascia. I think the finish would be much nicer. I kind of like Formica Black Matte. 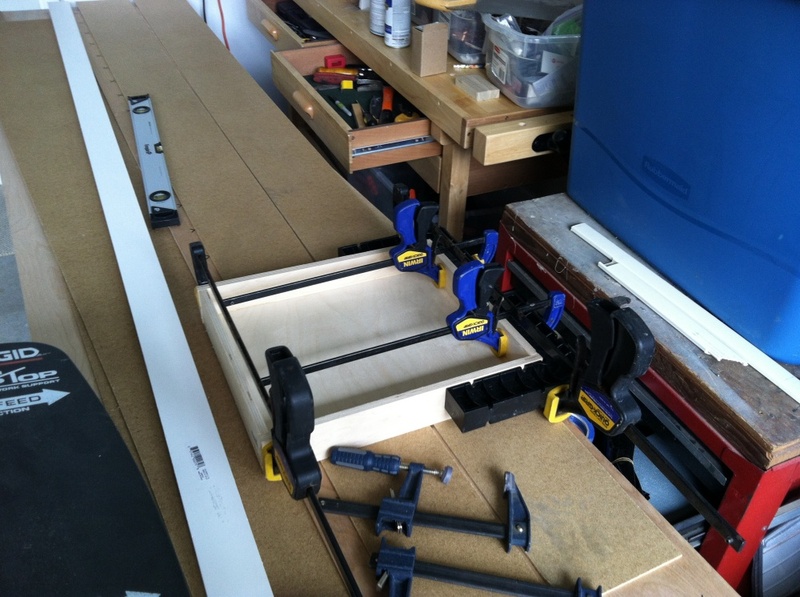 I bought 2 1/2″ drawer sides at Rockler. 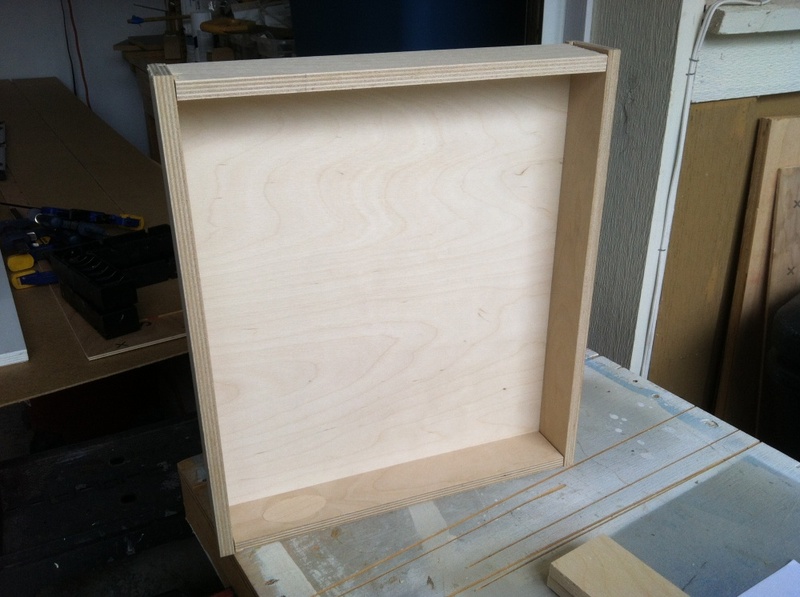 The sides are nicely machined 1/2″ thick birch, they have a 1/4″ dado slotted out for a drawer bottom. 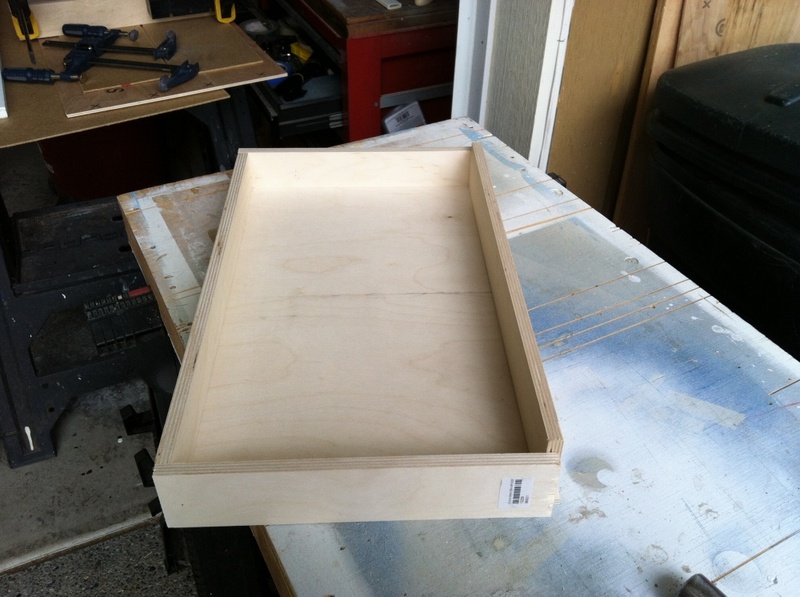 I bought some 1/4″ Baltic Brich plywood for the drawer bottoms. 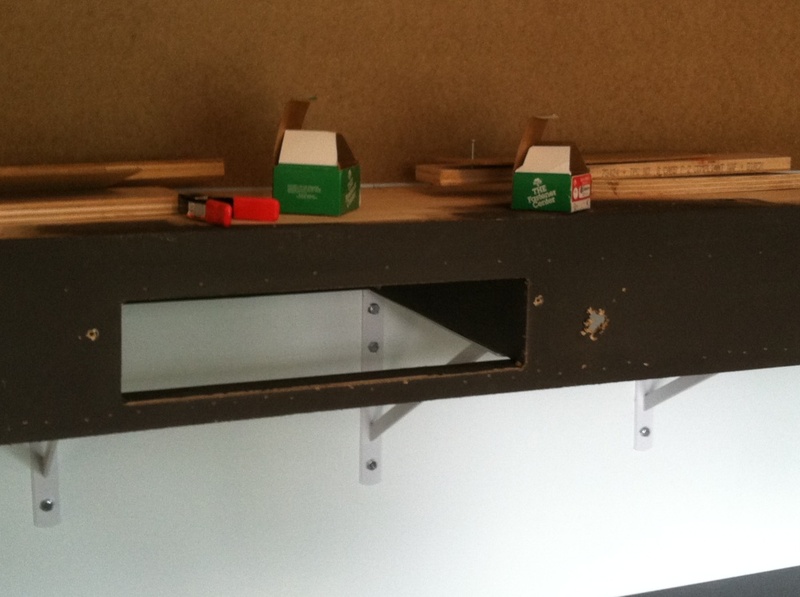 Assembling the drawers is fairly easy: cut to size, test fit, glue, and clamp. I made three drawers. two for the east side and one for the south side. 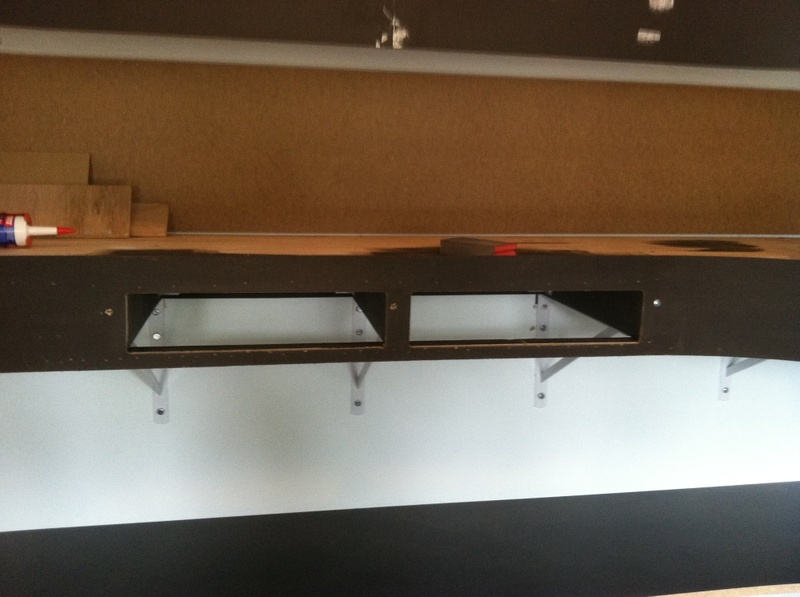 The drawers will be painted black before installing.